Northey Island01621 853142work Nature ReserveNorthey is an island in the Blackwater Estuary in Essex, connected to the mainland by a causeway that is covered by the tide twice every day. It is a Site of special scientific interest with a large area of undisturbed Saltmarsh. It is also the site of the Battle of the Maldon in AD991 making it Britain's oldest recorded battlefield site. Guided tours can be organised only by prior arrangement. Northey is an island in the Blackwater Estuary in Essex, connected to the mainland by a causeway that is covered by the tide twice every day. 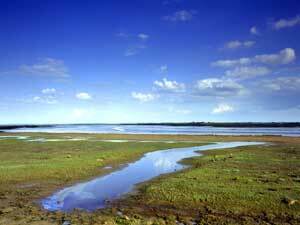 It is a Site of special scientific interest with a large area of undisturbed Saltmarsh. It is also the site of the Battle of the Maldon in AD991 making it Britain's oldest recorded battlefield site. Guided tours can be organised only by prior arrangement. Access is by advance permit only; please contact the Warden 01621 853142 or email northeyisland@nationaltrust.org.uk to arrange a visit. Northey House and out buildings are let on a private lease and are not open to the public. Free to National Trust members, £2.00 per person for non-members.